A wide area of the Orvieto Cathedral façade is decorated with mosaics that were conceived and carried out following a precise iconographic programme. The mosaics represent some life episodes of the Virgin Mary, the mother of Jesus, one of the most worshipped figures of the catholic Christianity. The choice to decorate the façade with mosaics lying on a gold background was quite unusual in the XIV century in Italy. The mosaic, which has early Christian origins or dates to the last period of the Roman Empire, is a kind of art that spread throughout the Eastern Roman Empire. In Italy, the most meaningful city as regards the mosaic is Ravenna, one of the last bastions of the Byzantine culture in the peninsula. The decision to enrich the Dome of Orvieto with these mosaics stemmed from the will to give as much splendour as possible to what the inhabitants of Orvieto immediately considered as the monument and symbol of their city. Besides, this work encouraged the local glass industry. This "Marian cycle" depicts scenes as the nativity of the Virgin Mary, her wedding, her arrival in the temple and the Annunciation. It has its apex in the scene of her Coronation, visible on the central tympanum. 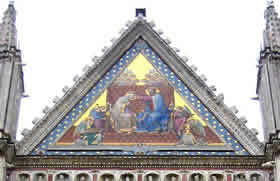 Part of the mosaics regards the Baptism of Christ, visible above the left portal. Even if this scene is not in line with the others, it was represented, anyway, because the Font is near that entrance. Many glassmakers, painters and mosaicists followed one another to create the mosaics. This work started in 1321 and lasted until the XVI century. Lorenzo Maitani, designer and realizer of the façade, participated in it and under his supervision the decorations on the towers, on the bars and on the frames were carried out. The "Battesimo di Cristo" was created between 1359 and 1360 by Giovanni di Bonino, who also took part in the realization of the stained glass window of the apse inside the Dome. Fra' Giovanni di Leonardello and the painter Ugolino di Prete Ilario from Ovieto were the authors of the mosaics of the "Annunciazione" and the "Natività". The local mosaicist Piero di Puccio from Orvieto worked on the mosaics between 1370 and 1380. In the XVI century, Cesare Nebbia contributed to carry out the panel of the main frontispiece. This work was totally finished in the XVIII century, with the "Presentazione al Tempio" by Giuseppe Ottaviani that substituted the one created by Piero di Puccio. In effect, on the Dome's fifth centenary, some original mosaics were took down and given to the then pope Pius VI. Unfortunately, almost all of them were lost. Only the "Natività di Maria" avoided this unlucky destiny and it is still preserved inside the Victoria and Albert Museum of London.